The story of the FLDS’ “lost boys” is a heart-wrenching one. One wonders why there haven’t been more prosecutions for child abandonment and neglect when so many victims are going public. There are, after all, legal ways to go after the cult without indiscriminately ripping their families apart. On a related note, the deranged psychopath who heads the FLDS has apparently admitted that he is “not the prophet”. Here’s the chilling video, and here’s an article with context. FLDS members are reportedly skeptical. CPS just can’t seem to keep its story straight. I’ve always had a soft spot for Texas. Of all the southern states, it has the most in common with California – the Spanish and Mexican influence, the Catholic place names, the wild west heritage, the cattle and cotton empires, the independent streak, the sheer “bigness” of the place. I’ve liked every Texan I’ve ever met, and there are many Texas transplants in California’s rural hinterlands. I used to think of Texas as a kind of uncorrupted California, what California might have become if the radicals hadn’t taken over. So this whole fiasco surprises me. If you live in Texas, perhaps you could fill me in. Is the “Eldorado roundup” just another side of the Texas personality, the dark side of Texas frontier “justice”? Or is this completely out of character for your state? “I have never felt so strongly the invisible, but highly tangible bonds of the mystical body of Christ. I saw clearly why it is so important for the Church to be united under one vicar of Christ, one visible shepherd for the flock. It is not lightly he wears the pallium made of lamb’s wool; so evocative of the shepherd carrying the lost lamb home upon his shoulders. I think Pope Benedict came to America hoping to carry home lost sheep – hoping, and not expecting, the outpouring of love that he received. Souls are thirsting nigh unto death for the Living God, and Benedict carried Christ to them; in his heart and in his hands, in humility and in love; fully aware of the poverty of his human limitations but in full knowledge that with God, nothing is impossible. It is true that the FLDS cult is – or should be considered – a problem for the state on several levels. Polygamy is a problem for numerous reasons, many of which have been addressed by my commenters. Other beliefs and practices of this cult are destructive and disordered (although they don’t seem so bad when compared with mainstream American culture). The state has a legitimate interest in suppressing the FLDS and discouraging its growth. The problem is that we have a secular state that claims (falsely and deceitfully) to be neutral in matters of religion. The state has abandoned, for example, all religious justifications for the institution of marriage, and therefore cannot easily make an argument against polygamy or any other oddball marriage practices. The doctrine of religious liberty forbids the state from openly suppressing any religious cult unless a “non-religious” justification can be found. But a secular and religiously indifferent state is not only impossible, it is foreign to Catholic social thought. The state is obliged to favor truth in religion and morality. Because of fallen human nature and the fact of religious pluralism in many places, the state is also obliged to tolerate a degree of error in order to prevent greater evils. But it is not obliged to tolerate every error, and it is sometimes obliged to legislate against error – that is, against specifically religious error, openly stating the truth of the matter without having to search for a dishonest pretext. As is the case with Islam, the FLDS is exposing religious neutrality for the fraud that it really is. At some point the state has to discriminate. And there’s nothing inherently wrong with that. The danger, for us, is that it will end up persecuting any group that does not conform to the American Secular Religion with its gods of Materialism, Hedonism, Individualism and Egalitarianism. I believe that is exactly what we are witnessing in Texas. I would like to see our state and local governments openly acknowledge a bias for creedal Christianity: that is, for the Catholic and Orthodox Churches and those ecclesial communions that have their origins with the Reformation. This would give the state a legal framework for dealing with cults like the FLDS (not to mention Islam). The cults could therefore be legally restrained and prevented from flourishing before reaching the level of human tragedy we are witnessing in Texas. But let’s face it: that isn’t going to happen anytime soon. The next best thing is to try and maintain the fiction of religious neutrality in order to prevent the wrong kind of persecution. That pretty much means letting the cults do their own thing. 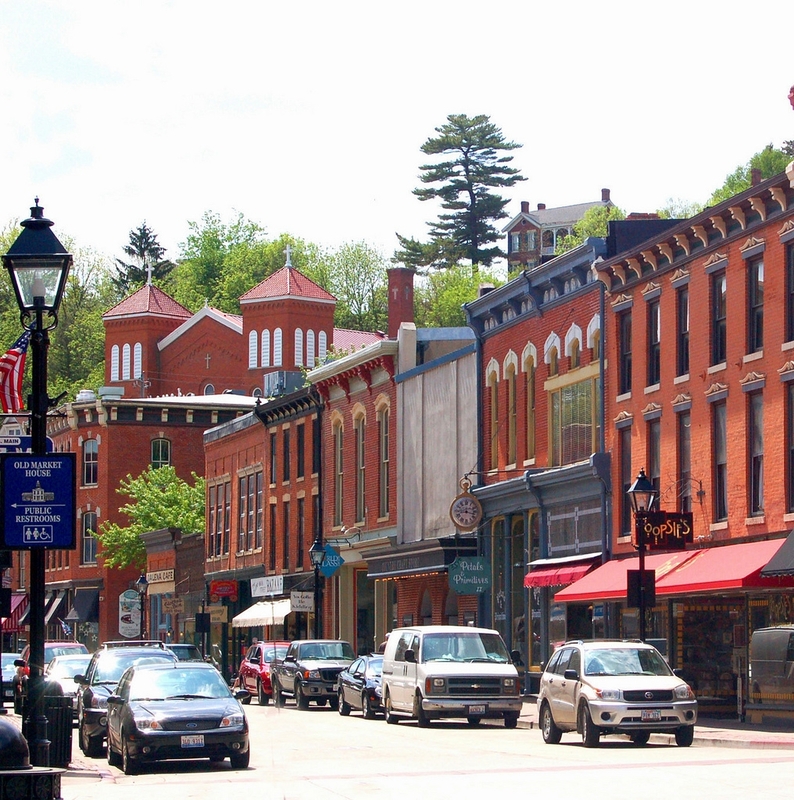 That also means – when the time is ripe – permitting the growth of Christian enclaves throughout the land, places where Catholic values are not marginalized, where faith is not banished from the public square, and where families can preserve their children’s innocence without becoming virtual hermits. “The children suffer behind an iron curtain of corrupt secrecy. That curtain was lifted a few years ago, long enough to get a brief but terrifying glimpse of what was being done by people who had placed themselves beyond accountability. The obvious course of action would be to mount an armed raid to liberate those children, by whatever necessary means, from the abusive system in which they’re being held. Courtesy of the Young Fogey at A Conservative Blog for Peace. 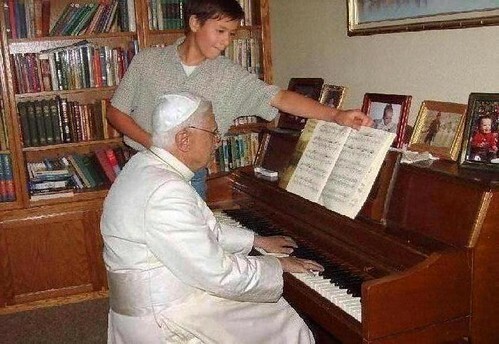 Pope Benedict XVI dropped in last week to give Jonathan a few tips on the piano.